Thomas brought in 11 of his 13 targets for 98 yards in the Saints' 28-14 win over the Buccaneers on Sunday. Thomas (ankle) was a full participant in Thursday's practice. Analysis: Thomas' activity confirms that his lack of participation in Wednesday's session was for maintenance purposes more than anything else. 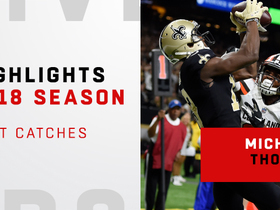 The Saints' top wideout can be locked into fantasy lineups with confidence come Sunday, when he'll face off against the same Tampa Bay squad he torched for 16 receptions for 180 yards and a touchdown in Week 1. Thomas (ankle) returned to practice Thursday, Josh Katzenstein of The New Orleans Times-Picayune reports. Analysis: After being held out of Wednesday's session, Thomas at least is managing some reps Thursday, which bodes well for his Week 14 availability. During the previous weeks in which he missed a practice with an injury or ailment -- Weeks 2 and 9 -- he was a full participant the next day and proceeded to dismantle his upcoming opponents (the Browns and Rams, respectively) to the tune of 24 catches (on 28 targets) for 300 yards and three touchdowns. Thomas was held out of Wednesday's practice with an ankle injury, Greg Auman of The Athletic reports. Thomas brought in five of eight targets for 40 yards in the Saints' 13-10 loss to the Cowboys on Thursday. He also recovered a fumble. Thomas hauled in four of six targets, managing only 38 yards during Thursday's 31-17 win against the Falcons. Thomas hauled in all four of his targets for 91 yards and a touchdown in Sunday's 48-7 win over Philadelphia. Thomas caught all eight of his targets for 70 yards and two touchdowns during Sunday's 51-14 win over Cincinnati. Thomas caught 12 of 15 targets for 211 yards and a touchdown during Sunday's 45-35 win over the Rams. Thomas (shoulder) practiced in full Thursday. Analysis: The Saints limited Thomas' practice reps Wednesday as a result of a shoulder injury, but it didn't hinder his ability to participate in all drills Thursday. He has a great chance to produce Sunday versus a Rams defense that has yielded 9.2 YPT and 11 touchdowns to wide receivers this season. Thomas didn't practice Wednesday due to a shoulder injury, the Saints' official site reports.. Analysis: In the Saints' Week 8 win over the Vikings, Thomas earned his third-fewest number of targets (six) in a given game this season, but nonetheless emerged with an injury of unknown severity. As a result, his status will be monitored closely this week to gain a sense of his chances to play in Sunday's showdown against the Rams. Thomas wasn't present during the portion of Wednesday's practice open to the media, Josh Katzenstein of The New Orleans Times-Picayune reports. Analysis: The reason for Thomas' absence won't be known until the Saints release their first Week 9 injury report. For the season, Thomas leads all NFL players with at least 15 receptions in catch rate at 90.6 percent (58 of 64). Thomas caught five passes (six targets) for 81 yards in Sunday's 30-20 win over the Vikings. Analysis: While this wasn't Thomas' biggest fantasy day, it was certainly strong considering that Drew Brees passed for just 120 yards all game. The 25-year-old's incredible three-week start to the season may have been unsustainable, but he continues to have strong fantasy value as Drew Brees' top outside receiving option. Expect Thomas to be busy Sunday against a Rams defense that is weakest in its secondary. Thomas caught seven of nine targets for 69 yards and a touchdown during Sunday's 24-23 win over Baltimore. Thomas caught four of five passes for 74 yards in Monday night's 43-19 win over the Redskins. Analysis: Thomas continues to haul in basically everything thrown his way, even though his totals over the past couple weeks have been less stellar than his three-week start. Still, on the back of Monday's outing, he's topped 70 yards in all but one game thus far, making him as consistent as they come at the wideout position. Now entering New Orleans' bye week, Thomas' next action will come Week 7 versus Baltimore. Thomas caught all four of his targets for 47 yards in Sunday's 33-18 win over the Giants. Thomas caught all 10 of his targets for 129 yards in Sunday's 43-37 overtime win over Atlanta. Analysis: Thomas hauled in a 35-yard pass on the game's first play, then became a part of history in the second quarter by catching Drew Brees' NFL-record setting 63,001st career completion for a gain of 17. 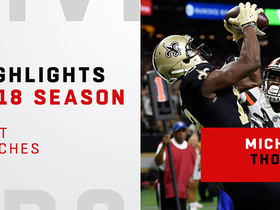 While New Orleans' top wide receiver didn't get into the end zone, he recorded double-digit receptions for the third consecutive game to open the season. Even with a road tilt against a tough Giants pass defense next week, Thomas will be a must-start. Thomas brought in 12 of 13 targets for 89 yards and two touchdowns in the Saints' 21-18 win over the Browns on Sunday. He also lost a fumble. Thomas (illness) was listed as a full participant in Thursday's practice, Josh Katzenstein of The New Orleans Times-Picayune reports. Analysis: Even though an illness prevented Thomas from practicing Wednesday, there was never much concern about his availability for the Saints' Week 2 matchup with the Browns. Thomas' full participation in Thursday's session officially removes any doubt, making him an easy activation for fantasy owners coming off a 16-catch, 180-yard performance in the Saints' season-opening loss to the Buccaneers. Thomas (illness) participated in Thursday's practice, Josh Katzenstein of The New Orleans Times-Picayune reports. Analysis: An illness befell Thomas on Wednesday, resulting in a DNP, but a return one day later indicates it was a temporary concern. Even if he's listed as limited on Thursday's injury report, he appears to be on track for an appearance Sunday against the Browns. Thomas didn't practice Wednesday due to an illness, Adam Caplan of SiriusXM Radio reports. Analysis: Fortunately for Thomas' owners, he picked up the illness mid-week instead of within sight of game day. However, considering his stature in one of the top offenses in the league, he'll want to take the practice field Thursday or Friday to allay any concerns about his availability. Assuming Thomas plays Sunday against the Browns, he'll be looking to uphold his lofty 16-180-1 line he delivered in the Saints' Week 1 loss to the Buccaneers. Thomas (undisclosed) was absent from practice Wednesday, Josh Katzenstein of The New Orleans Times-Picayune reports. Analysis: Thomas didn't show any signs of an injury during his 180-yard outburst in Sunday's season-opening loss to the Buccaneers. There's always a chance he was held out of Wednesday's session for rest-related or personal reasons, but the Saints' injury report should offer more clarity on that front. Thomas brought in 16 of 17 targets for 180 yards and a touchdown in the Saints' 48-40 loss to the Buccaneers on Sunday. He also lost a fumble. Thomas caught two passes for 29 yards in Saturday's preseason tilt against the Chargers. Analysis: Thomas has six catches for just 57 yards through three preseason games, but most importantly he has thus far avoided injury during the largely meaningless exhibition period. He's unlikely to play in the team's final preseason tilt Thursday, so the Saints' No. 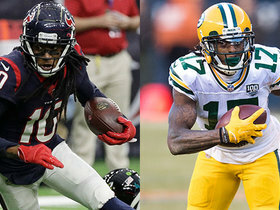 1 receiver should be locked in as an elite fantasy option once the games count. Thomas caught two passes on three targets for 12 yards in Friday's preseason game against the Cardinals. Analysis: Starting quarterback Drew Brees sat out the Saints' second preseason game, and Thomas accomplished little with backups Tayson Hill and Tom Savage under center. Still, no player in NFL history has caught more passes in his first two seasons than Thomas, who should again rank as a No. 1 fantasy receiver once the games start to count. Thomas said he added some muscle without gaining weight this offseason, Nick Underhill of The New Orleans Advocate reports. Thomas caught seven of 13 targets for 85 yards and two touchdowns during Sunday's 29-24 NFC divisional-round loss to the Vikings. Thomas caught eight of nine targets for 131 yards in Sunday's 31-26 NFC wild-card win over the Panthers. Analysis: Thomas was tremendous in his playoff debut, catching just about everything thrown his way. 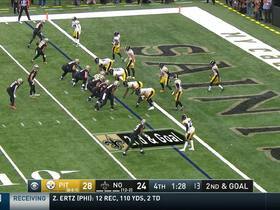 The 24-year-old's lofty totals, which led the Saints across the board, also included a season-long, 46-yard gain. With clutch catches sprinkled in as well, Thomas will now prepare for next Sunday's divisional round matchup against cornerback Xavier Rhodes and the Vikings. Thomas (hamstring) was a full practice participant Thursday. Thomas (hamstring) was a limited participant during Wednesday's practice, Josh Katzenstein of the New Orleans Times-Picayune reports. 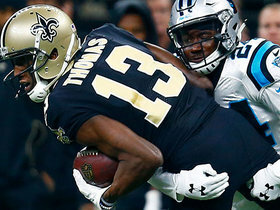 Analysis: Thomas' minor hamstring injury kept him limited during multiple practices heading into the Saints' regular season finale against the Buccaneers last week as well, while the issue doesn't expect to threaten his potential availability for Sunday's wild-card matchup versus the Panthers. The Saints' No. 1 receiver has seen just 13 total targets throughout their past two contests combined, but he could be in line for a larger workload during the playoffs as he eases his way back to full strength. Thomas secured six of eight targets for 94 yards in Sunday's 31-24 loss to the Buccaneers. Thomas (hamstring) doesn't have an injury designation for Sunday's game in Tampa Bay, Jenna Laine of ESPN.com reports. Analysis: A limited practice participant throughout the week, Thomas could return to his usual workload despite never quite making it back to a full practice. He had season-low marks for snap share (62.5 percent) and targets (five) in last week's 23-13 win over the Falcons. The Saints can't afford to take it easy, as a loss would put them in danger of falling to the No. 5 seed in the NFC. Thomas (hamstring) was a limited participant during Thursday's practice, Herbie Teope of The New Orleans Times-Picayune reports. Thomas (hamstring) was listed as a limited participant at Wednesday's practice, Larry Holder of The New Orleans Times-Picayune reports. Thomas (undisclosed) wasn't present during the portion of Wednesday's practice open to the media, Joel A. Erickson of The Baton Rouge Advocate reports. Thomas (hamstring) nabbed four of five targets for 66 yards in Sunday's 23-13 win over the Falcons. Thomas (hamstring) is listed as active Sunday versus the Falcons, Nick Underhill of The Baton Rouge Advocate reports. Analysis: The Saints caused a stir with the addition of Thomas to the injury report Saturday. After a pregame workout, though, his hamstring was deemed ready to handle the rigors of game action. 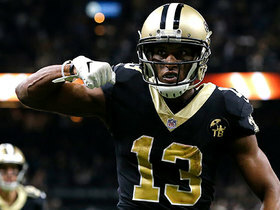 During the Saints' previous matchup with Atlanta two weeks ago, Thomas posted 10 catches (on 14 targets) for 117 yards and one touchdown, all season bests for the second-year wide receiver. Thomas (hamstring) is expected to play Sunday against Atlanta, Adam Schefter of ESPN reports. Analysis: Thomas was a late addition to the injury report Friday, so this situation needs to be monitored closely despite this report. Fantasy players will want to check his status in warmups before the Saints kick off at 1:00 ET on Sunday. In the event that Thomas is limited or out Sunday, the Saints would turn to fellow wideouts Ted Ginn (who is slated to return from a rib injury), as well as Brandon Coleman, Willie Snead and Tommylee Lewis. Thomas has been added to the Saints' Week 16 injury report, Herbie Teope of The New Orleans Times-Picayune reports. The wideout is now listed as questionable for Sunday's game against the Falcons with a hamstring injury. Analysis: Thomas has been on a roll of late, so this situation needs to be monitored closely, given that late injury report additions can be unsettling. Fortunately for those looking to use Thomas in Week 16 fantasy lineups, the Saints kick off at 1:00 ET on Sunday. In the event that Thomas is limited or out Sunday, the Saints would turn to fellow wideouts Ted Ginn (who is slated to return from a rib injury), as well as Brandon Coleman, Willie Snead and Tommylee Lewis. Thomas brought in nine of 11 targets for 93 yards and a touchdown in Sunday's 31-19 win over the Jets. Analysis: Thomas' reception, receiving yardage and target totals were all season highs, and he scored a touchdown for the third straight contest. The second-year wideout has posted 19 catches overall in the last pair of games, and factoring in Sunday's production, he's now only the second player in NFL history with at least 90 catches in his first two seasons. Thomas will look to continue building on his strong season versus the Falcons in Week 16. Thomas brought in 10 of 14 targets for 117 yards and a touchdown in Thursday's 20-17 loss to the Falcons. Analysis: Thomas paced all pass catchers in receptions and yards while generating his second 100-yard effort of the season. The second-year wideout has touchdowns in back-to-back games and has seen double-digit targets in four of his last six contests. With a clear role as Drew Brees' No. 1 wideout, Thomas will look to exploit a vulnerable Jets secondary in a Week 15 home tilt. Thomas caught five of nine targets for 70 yards and a touchdown in Sunday's 31-21 win over the Panthers. Thomas caught five of eight targets for 52 yards during Sunday's 26-20 loss to the Rams. Analysis: Thomas has operated as a high-floor, low-ceiling fantasy option all season, and that notion certainly endured through Sunday's game. 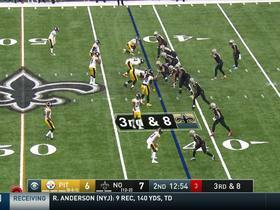 The issue seems to be the Saints' tendency to go away from its passing game in the red zone. In fact, Thomas hadn't seen a red-zone target in four games entering Week 12. He got one opportunity against the Rams, but was tackled at the three-yard line by cornerback Kayvon Webster. Expect more of the same from Thomas when the Saints host the Panthers in Week 13. Thomas recorded six catches for 91 yards on 11 targets in Sunday's 34-21 overtime win against the Redskins. Analysis: Thomas tied for the team lead in both catches and yards while leading New Orleans in targets. While the second-year receiver has topped 80 yards in six of 10 games, Thomas has only made two trips to the end zone after scoring nine touchdowns as a rookie. Thomas recorded 117 receiving yards while catching nine of 10 targets during Sunday's 47-10 win over the Bills. Analysis: Thomas came up with his most productive game of the season, setting personal bests in both catches and receiving yardage. The running game dominated the day, but the second-year wideout was still prominently featured in the passing game, finishing with six more targets than the next closest teammate. 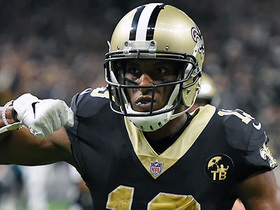 Thomas' role as Drew Brees' top target affords him a solid weekly floor for production, and he should be in line for another strong showing next week at home against the Redskins. Thomas (ankle) doesn't have a designation in advance of Sunday's game in Buffalo, Herbie Teope of The New Orleans Times-Picayune reports. Analysis: Limited by an ankle injury both Wednesday and Thursday, Thomas returned in full Friday, effectively shedding any doubt about his ability to play Week 10. He'll thus act as the No. 1 option for Drew Brees against the Bills' 26th-ranked pass defense (250.3 yards per game). Thomas (ankle) was a limited participant in Thursday's practice. Analysis: While Thomas has been limited in both of the Saints' first two practices to begin the week, the fact that he's merely participating should clear up most of the concern surrounding the wideout's health. Thomas dealt with a knee issue and was limited in back-to-back practices last week before practicing fully Friday and playing in Sunday's 30-10 win over the Buccaneers; the Saints will hope he follows a similar path in Week 10. Thomas was limited in Wednesday's practice due to an ankle injury. Analysis: Last week, Thomas was afflicted by a knee injury, progressing from a DNP on Wednesday to an uninhibited practice Friday. On this occasion, the ailment has changed, but his ability to practice in the first session bodes well for his availability Week 10. Operating at less-than-optimal capacity Sunday against the Buccaneers, Thomas reeled in eight of 11 passes for 65 yards, so he's proved capable of effective stat lines, even if his health has been compromised. Thomas (knee) didn't participate in the open portion of practice Wednesday, Joel Erickson of The Baton Rouge Advocate reports. Analysis: Thomas built up from no activity last Wednesday to a full session Friday, so the groundwork has already been established for management of his knee injury. His official workload for this Wednesday's session will be known when the Saints release their first Week 10 injury report later in the day. Thomas brought in eight of 11 targets for 65 yards in Sunday's 30-10 win over the Buccaneers. 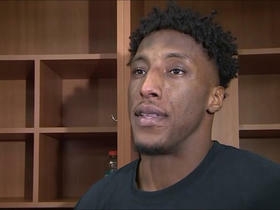 NFL Network's Jane Slater catches up with New Orleans Saints wide receiver Michael Thomas after his team's narrow NFC Championship Game loss to the Los Angeles Rams. NFL Network's Kyle Brandt shares what he thinks is the most intimidating factor heading into the NFC Championship game on GMFB. 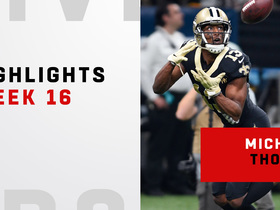 Check out all of New Orleans Saints wide receiver Michael Thomas' best catches from the 2018 regular season. Thomas had 125 receptions for 1,405 yards and 9 touchdowns. 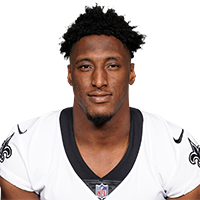 New Orleans Saints wide receiver Michael Thomas had 11 catches for 109 yards and one touchdown against the Pittsburgh Steelers in Week 16 of the 2018 NFL season. New Orleans Saints quarterback Drew Brees connects with his wide receiver Michael Thomas for 20 yards.